Médecins Sans Frontières (MSF) denounces the exorbitant price governments and non-governmental organisations are required to pay to vaccinate vulnerable children. 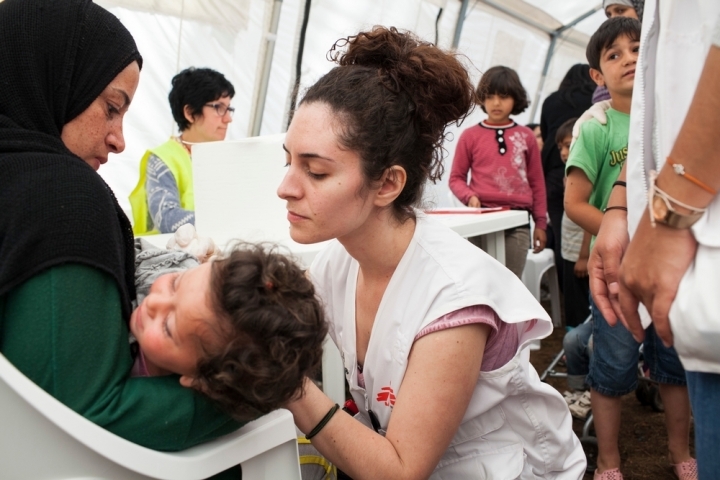 In the past few weeks, MSF has vaccinated more than 5,000 refugee children between ages six months and 15 years of age in several camps and settlements across Greece. MSF vaccinated refugee children against ten diseases, including pneumonia. Pneumonia remains the single largest killer of children under five worldwide, and is particularly acute for children living in crises. MSF called on Pfizer and GSK to drop the price of the pneumonia vaccine (PCV) for governments and humanitarian organisations in emergency contexts. MSF paid 60 Euros (US$68.10) per dose for the pneumonia vaccine, which it bought through local pharmacies. This is 20 times more than the lowest global price of the vaccine, which is roughly 2.80 Euros (US$3.10) per dose. Despite vaccinating highly vulnerable children, humanitarian organisations such as MSF are unable to purchase vaccines at the lowest available price. This lowest global price for the pneumonia vaccine is only available to the world’s poorest countries through Gavi, the Vaccine Alliance. Three doses of the pneumonia vaccine are needed to provide full protection for a child. Another vaccine used by MSF during these campaigns protects children against six diseases and is also expensive, priced around 65 euros per dose. 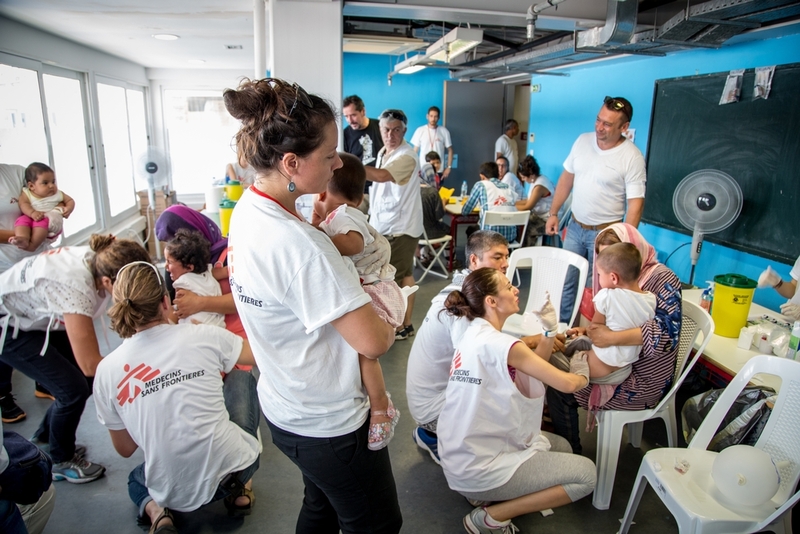 “Governments and humanitarian organisations need tools to protect children living through one of the biggest crises of our times,” said Dr. Apostolos Veizis, Director of MSF’s Medical Operational Support Unit in Greece. “Pfizer and GSK must drop the price of the pneumonia vaccine." Hulud has her children vaccinated at a vaccination campaign organized by MSF at a camp near Evzeni, Greece. "With the collapse of the healthcare systems in Syria, Iraq and Afghanistan, most children living in the camps and outside have not been immunised in their country or during the journey. These kids are living in horrendous conditions and should not pay the price of fleeing for their lives with their health. We have to protect them at all cost against pneumonia and other deadly diseases,” said Veizis. For more than six years, MSF has tried to negotiate a lower price for the pneumonia vaccine with its only two producers, Pfizer and GlaxoSmithKline (GSK), in order to be able to protect crisis-affected children from pneumonia. So far, both pharmaceutical corporations have refused to reduce the price and there remains no solution in sight for populations living in crisis. In May, MSF delivered the names of more than 416,000 people from 170 countries who signed a petition asking Pfizer and GSK to reduce the price of the pneumonia vaccine to $5 dollars per child (for all three doses) for crisis-affected populations and for all developing countries. MSF vaccinated 3,000 children in Idomeni on the border between Greece and the Former Yugoslav Republic of Macedonia (FYROM) in May, then in the camps of the Attica region in Central Greece, on the island of Samos, in Athens and in the coming weeks the MSF will be vaccinating children in the camps of Epirus, and on the Island of Lesbos in collaboration with the Ministry of Health.